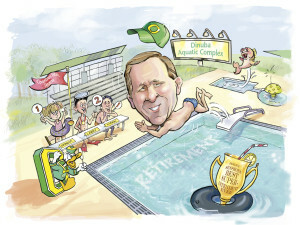 To honor a retiring colleague, remember and celebrate a favorite life event, or give an achievement award of intensely personal value commission the gift of humor, caricature. The artwork can be shared, via social media or on merchandise, on a website or simply hung on a wall. It opens conversations and memories for the recipients that will be rewarding and one of a kind. Life events such as a graduation, birthday, anniversary or retirement can be enjoyed by all as they contribute their memories and knowledge of the subject and their relationship. Make it a team building experience and have those who know them best write any experiences or pranks they may have shared. The following is not a complete list of what you should consider in creating the ultimate personal gift…but it may spark some ideas of how to honor or prank the person who deserves it most! Or have others do it! Ask colleagues, family and friends who know them best to help provide what is needed. Should it be inside or outside? At a desk or in action? Or a combination of both? What would they like to be wearing? Workplace Casual or Formal? Uniform, Suit and tie or recreational. Art can include Boxer Shorts with a tuxedo top. Use your imagination as to what would be most appropriate for your subject. Dignified? or can they be safely pranked? Asked to do a man as a cheerleader, I was advised to take him out of the skirt I had drawn him in and replace it with sweat pants…more appropriate for this man sensitive about his gender image. What is your subject known for? Are they cheerful, organized, or shy? Do they have a trademark gesture or saying? Is there a feature that they are proud of? Something the artist should avoid? Pets, can provide an emotional tug and humorous addition, as they can be put in situations that would be impossible in real life, driving a car, or offering advice. Add children or colleagues or imaginary friends! Provide at least 2 photos of each. 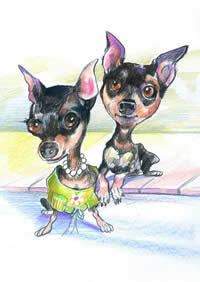 These can be represented as caricature or simply inserted in a picture on the wall behind the subject. Adding the people they love, will increase the value of the artwork for the recipient. Favorite team, sport or activities. Include Logos, or mascot images. Favorite books. Many love the work of the organizations they support – and including them in the artwork gives them a plug. If they volunteer for an organization or have a passion for the environment this will be something they can share with them. Provide Logos, or photos of the place, building, or the occupational tools of their trade. What is their go-to relaxation, stress reduction spot or activity? Some of the items listed may considerably increase the cost of the caricature, but prioritizing the list, and choosing simple items carefully can give you a wonderfully personalized treasure that will also give the gift of laughter. What could be better!